Lutheran High School East, operated by the Cleveland Lutheran High School Association, is chartered by the Department of Education of the State of Ohio and is fully accredited by AdvancEd, the largest accrediting organization in the United States. As a college preparatory high school, Lutheran High School East offers courses that prepare students for success in academic life beyond the high school years. Students are challenged in the school's curricula based upon their individual academic preparedness. The core curriculum has essentially three "tracks". Honors/AP/PSEOP courses prepare students for the most rigorous of college experiences, college preparatory (the typical track that fully prepares students for their collegiate years), and the remedial courses which are designed to reinforce important base concepts that may not have been previously learned. Reflecting our commitment to a Christ-centered education, religion courses are required for every semester that a student is in attendance. The elective curriculum has tremendous depth and variety. Lutheran East offers curricular opportunities in art, music, technology, foreign language, physical education, and home economics. 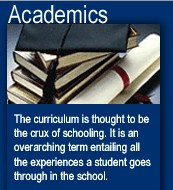 The curriculum again demonstrates the numerous opportunities that are available to all students. Students are additionally prepared for standardized testing, including the OGT, PSAT, SAT and ACT. Tutoring is offered for those students needing additional assistance in classes or in standardized test preparation.